Our primary mission here at Open Legal Services is to hire lawyers that need jobs to help people that need lawyers. 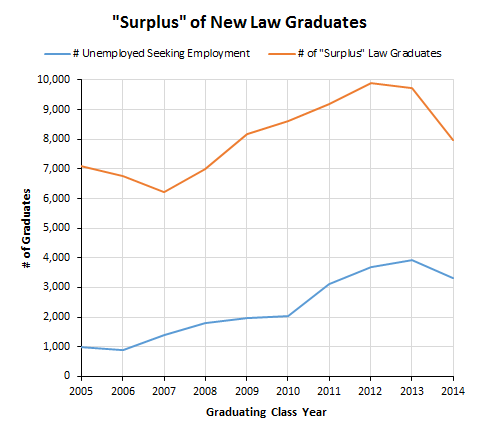 The Great Recession had a disproportionate effect on the legal job market, with high unemployment rates among newly graduated attorneys. But how high? I found some good statistics from the National Association for Law Placement, Inc., which has been collecting employment data for the past 30 years or so. Each year they publish a report of employment data for the previous year’s graduating class. In addition, I found graduation and enrollment statistics from the American Bar Association. I love data like this, so to get a feel for the legal market over time I have pulled together longitudinal data from these reports to create the following chart. 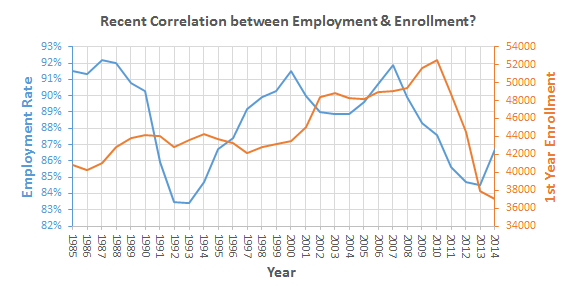 The recession in the early 1990’s decreased the employment rate among newly graduated lawyers by about 10%, yet it had no discernible effect on the enrollment rate. So people looking at going to law school either didn’t realize that they would have a hard time getting a job afterward, or they hoped that the job market would bounce back by the time they graduated. The recession starting in 2008 started another decline in the new lawyer employment rate. This time the law school enrollment numbers followed suit, but only after a three year lag. Does this mean that it takes three years for potential law students to respond to economic signals? Or does this mean that it took three years for people to give up hope that the legal job market would bounce back? 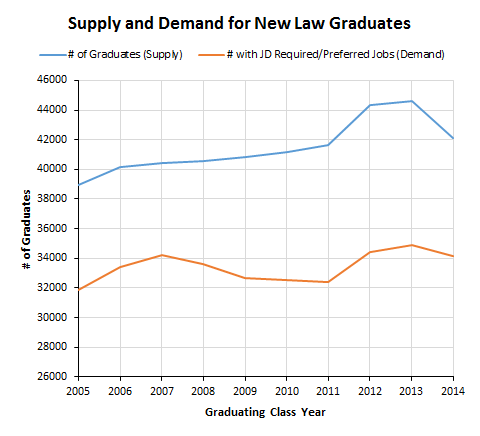 Another way of looking at the supply and demand for lawyers is to plot the total number of law graduates (supply) and the subset of graduates that found jobs where a JD is either required or preferred (demand). The supply of lawyers has continued to grow faster than the demand. The difference between these two lines is an approximation of the surplus number of lawyers produced each year. Another measure of the surplus production of attorneys is the number of attorneys that are seeking employment but are unemployed. I have plotted both in the following chart which shows that the surplus is finally starting to diminish. Perhaps I should consider going to law school? What forces do you think are driving the legal market today? What forces should we be watching for in the future? What other data sources should I be looking at to track these changes? Let me know in the comments or feel free to contact us. David McNeill is the Assistant Director of Open Legal Services. He is not an attorney – he has a PhD in Neuroscience and an MBA. I don’t know why; I think that’s a good question to ask the courts, possibly the self-help center. I know the Utah court system is working on electronic filing for self-represented parties, but I don’t know what stage they are at in implementing it. If you need Utah-specific legal advice, you can contact us through our contact page. In the same period, five new law schools have opened, cranking out even more lawyers to join those bemoaning the diminished rewards of their chosen career.